Healthy competition -- It's a thing, right? We all want our youth to succeed. We want them to win in the show ring or on the field or court. But what does that win look like to you? Is it winning the game, or is it learning a new skill or improving their performance? Being competitive and developing mastery can go hand in hand but there are times when that balance might need to be equalized. Competition is natural. Research shows that kids as young as four and five start to compare themselves to others. They start to develop the drive to compete. Competition is everywhere. 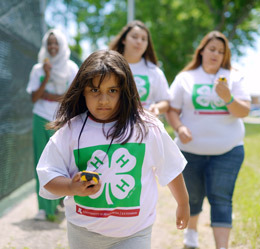 Whether in sports, jobs, school or 4-H, we find opportunities to compete with others. "By taking the emphasis off winning and putting it on mastery," Johnson said, "the individual and the team — classroom, country, world — will grow in the process." As youth work on mastery and begin to experience success at solving problems and meeting challenges they will then develop the self-confidence they need to feel and believe they are capable. "Competition involves more ego-oriented goals and tends to promote the attitudes that 'winning is everything'," writes the authors of the University of Illinois Extension's Putting Youth Back Into Sports training curriculum. It often discourages children from trying new tasks, but can encourage them to break the rules in order to win. Competition, unlike cooperation, often implies that any sport or activity is an individual sport, and teamwork is not a consideration." Angela Reinhart of the University of Illinois Extension, says that cooperation is key. Research as far back as 1978 shows that cooperation, the "willingness to work together to achieve a common purpose," empowers youth with creative problem solving skills, better communication skills, more sharing of emotions, and a better sense of community. Focus on the mastery of skills instead of the outcome. Youth will feel more successful whether or not they are "officially" the winner of the game. Be sensitive to each youth's skills, personalities, and temperaments. Offer activities that promote team efforts and encourage everyone to play a role in helping the team as a whole. Give encouragement and positive feedback to every member of the team. Help youth to see mistakes as learning tools. Encourage youth to set personal goals to challenge themselves and master skills. How do you help young people grow in their balance of mastery and competition? Trish this is a very timely article during County Fairs and now with the start of school and school sports. Something everyone (parents and coaches) need to keep in mind as they are involving youth in competition. So many times it is about the winning or spot on the team vs. the skills (social, leadership, communication and being healthy) which should be what it is about. Not only is it important to work on these skills but it is also how to win and loose with dignity. There have been many examples of really good and really bad ways of winning and loosing. Talking it through with the young person so they understand they gave their 110% and it does not always go in their favor. But look at what they have learned through the process. Your article would be great to have available during competitive events. Thanks for sharing. Thanks, Brian! You are so correct about having the conversation with the youth about what they learned or how they improved their skills is so important to their own growth and development. Thanks for taking the time to read the post! Hello Trish, I see this in my little one who is only happy when she scores a goal in soccer and her attitude is affected only when she wins or loses, rather than her ability to advance. Even with our 4-Hers, the response to projects is a "blue or "red"...rather than what they learned. I will try to frame the conversation about learning rather than achieving. Great article...you should send this off to newspapers for all parents to read. Thanks, Josh! I really like your comment about learning rather than achieving. Achieving is awesome but the learning that takes place as you advance in the achieving is so important to the young person. Sometimes in competitive situations we all forget that and refocusing on the learning helps. Thanks for writing this article! It can be a challenge to balance mastery and competition, which I see as a youth development professional and as a Mom. It seems so important to focus on the learning and help kids understand that will be them for the rest of their lives, rather than the ribbon placing. I know that I have learned more from my mistakes than the successes, however that can be challenging to communicate with youth at the time of disappointment. Adults can focus on the learning and ask more about the process, rather than the end result. Great topic to share with others! Thanks, Nancy! There is so much to learn from mistakes and or unmet goals and sometimes we just need to take the time to process that learning, especially with youth. If we can start that practice when they are young hopefully as an adult they continue that way of thinking. I appreciate the focus on mastery, Trish, and using it to frame the conversation on competition. I've tried to share with youth (including my own children) while they can't control who they are in competition with, they can control their effort and ability to master a skill, technique, or concept. In essence, they compete with self, with improvement and mastery signifying the "win." Perhaps it's improving their free throw percentage from the previous game or standing a notch higher in a swine class or a Science of Ag Team sharing their work with more community members. I wonder how we would change our recognition structure if we were competing against ourselves with mastery as the yardstick? Great question to ponder, Becky! It is true that we can only control our own actions and efforts which can be tough to understand as a young person. Helping youth understand the win comes from within and can be so very different than the win on the court or in that show ring. I am pondering Becky's question about changing our recognition structure if we were competing against ourselves with mastery as the yard stick. I am thinking about our Shooting Sports Wildlife program. The youth are mastering their skills in archery or air rifle, trying to perfect their aim. What other project areas/events are examples of competing against ourselves?